London twinkles over the winter time with an array of magical Christmas light displays to brighten up your Christmas shopping trips. Every year the lights have a different theme. For the first time in five years the world famous Christmas lights in Oxford Street will undergo a glittering transformation inspired by snowflakes. While at Greenwich the switch on will be accompanied by a lantern parade. We’re a little way off from hearing which ‘celebrities’ and pop ‘artists’ will be flicking the switch to light up London’s high streets this Christmas and when they’ll do it, but when we do know, we’ll update this page. In the meantime, satisfy your festive decoration cravings with our gallery of lights from Christmases past. If you are visiting London this Christmas make sure you join a special festive sightseeing tour. 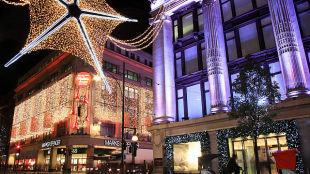 Posted on October 11, 2013, in Christmas Tours, Day Trips from London, Whats on London and tagged Festive Sightseeing, London Christmas 2013, Visit London. Bookmark the permalink. Leave a comment.